The Trump administration is keeping the president’s campaign promises supporting fossil fuels and pushing back on clean energy and efficient, clean transport. The State Department’s approval of the Keystone XL pipeline last week raised hackles further for many. Low-to-moderate gasoline and diesel prices aren’t helping make the business case for clean fuel and technologies, either. Breakthroughs in vehicle fuel efficiency and emissions reductions, clean fuel infrastructure, battery range, renewables, and electrified vehicles sales, are helping solidify the business case for policy and funding support; but, it isn’t the right time to gain broader support. Fleet operators and suppliers attending the Work Truck Show and Green Truck Summit recently in Indianapolis reported on mixed results for sales. Interest in alternative fuel trucks rose from 2011 through 2013, when fuel prices approached $4 a gallon nationally, but has stayed down since then. Customers are harder to see with payback on the investment taking longer. Perception of things changing in Washington also played into the mood. Some companies and fleets had good news to report. California-based Motiv Power Systems has been seeing an uptick for electric delivery trucks and school buses built on a Ford truck chassis. State-based incentive programs are taking the pressure off likely cuts in federal subsidies, the company said. California continues to be strong, and the New York and Chicago metro areas have paid off with similar purchase incentive programs in place. AmeriPride Services, a linen and uniform supply company, will bring 30 Motiv trucks to its fleet. Daimler AG’s Mitsubishi Fuso division said it will bring a new line of electric work trucks to North America this year. A lease program will be offered for its eCanter medium-duty electric truck. The company said it will also rollout a second generation model within two years. Fuso forecasts growing market demand for urban electric trucks as cities in Europe consider banning fossil-fuel trucks by 2030 through climate change policies; and pressure by cities to reduce congestion, pollution, and noise is helping grow demand. UPS, known for having the largest and most diverse alternative fuel fleet, announced it will spend $90 million to add six more CNG fueling stations and to purchase 390 CNG and 50 LNG trucks. Ohio-based Workhorse Group showed its all-electric pickup truck that will come to market next year. Recently, the company announced it has received Letters of Intent from fleets totaling 2,150 of the Workhorse W-15 electric pickups. Deals are being made with Duke Energy, Portland General Electric, the city of Orlando, Southern California Public Power Authority, Clean Fuels Ohio, and one other utility. Soon after the Work Truck Show, a port trucking company announced it will bring in low carbon natural gas engine trucks using Cummins Westport’s new ISX12 G natural gas engines. Total Transportation Services Inc., a large drayage trucking company serving the Ports of Los Angeles and Long Beach, has started using one of the trucks to move cargo containers around the port complex. An 8.9-liter version of the Cummins Westport engine has been certified by the California Air Resources Board to produce 90 percent less NOx than permitted in diesel engines under the current guideline of 0.2 grams per horsepower-hour; a 12-liter variation is also expected to gain CARB approval. If run on renewable natural gas, heavy-duty trucks can reduce greenhouse gas methane emissions by 70%, the company said. On the passenger vehicle side, several auto analysts see Trump rolling back fuel economy mandates as having limited effect – with other market forces leading the way. Aggressive targets Europe and China will have more impact on the globalized auto industry than it would have had years ago. Strong and growing consumer expectations for increasing fuel efficient vehicles is another market dynamic that can’t be ignored, they say. California, Oregon, and eight states in the northeast, are following California’s zero emission vehicle mandates. Collectively, these states make up 30 percent of U.S. auto sales. Automakers have faced many years of resenting California’s rules going back to catalytic converters and the first gas stations with E-10 gasoline. Now they’re concerned over high targets being far ahead of consumer demand for all-electric, plug-in hybrid, and fuel cell vehicles. Tangible growth in clean transportation and energy appear to need a combination of long-term strategic planning more common in Asia, and with technology innovations usually seen first in the U.S. and Europe. Automakers like Toyota and Honda are leading-edge in engine performance, efficiency, electronics, and alternative powertrains; but they tend to take a more conservative and gradual approach to rolling out zero emission vehicles and automated systems. That said, Toyota’s kaizen philosophy of “change for better” has influenced other global automakers and suppliers and brought improvements in quality, safety, and integrating its technologies with partners such as dashboard infotainment features. Luxury automakers are committing to roll out futuristic and electrified vehicles in large volumes much sooner, but they’ll need to gain sustained support from board members, shareholders, and customers. There is a great deal of concern about making electric vehicles more profitable. BMW’s “A new era has begun” video released last week says it all. Strategies are described for the company’s Vision Next 100 models from its BMW, Mini, Rolls-Royce, and BMW Motorrad motorcycle brands. The Motorrad Vision looks like it was designed for the next “Batman” movie; the three car models look like they won’t be released for a long time. Everything will be connected and automated, and most of them electrified. Commercial vehicle makers (heavy trucks, work trucks, vans, and buses) are in a similar spot, complying with stricter emissions standards and convincing buyers to reach a tipping point and make acquisitions taking longer to justify in return on investment. Europe and China emissions targets don’t appear to be lowering. EU headed there for years with concern over diesel with VW scandal pushing it over the edge. Daimler and BMW have taken on huge goals for sales with these markets being critical and Tesla’s presence and public awareness spreading globally. China is starting to cut back on manufacturer and car buyer subsidies, but the government stays committed to reducing emissions in the country. It’s plug-in vehicle sales boom is a sign of that, and China may take on a regulatory structure similar to California’s. While down at the beginning of the year with softening incentives, they seem to be going back up. Most of the experts speaking on industry panels, and writing white papers and policy on the issues, do see transformational technologies and mobility models moving along much faster than expected. The Institute of Transportation Studies at the University of California-Davis just released survey results tied into the ITS-Davis’ new policy initiative, “Three Revolutions: Sharing, Electrification and Automation.” That report features a set of policy briefs written by transportation policy experts; and in-depth survey interviews with 40 experts on the subject from government and nonprofit organizations, and representatives from automakers and technology companies. About 70% think that by 2040, fully autonomous vehicles will make up more than 20% of vehicles sold in the U.S. Shared rides will go from 5% of all passenger miles by 2030 to more than 20% of miles driven by 2040, according to about 80% of the respondents. 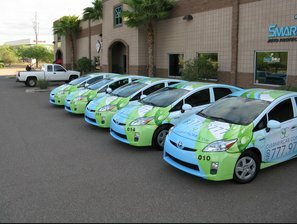 Most vehicles used by ridesharing and carsharing firms till be zero emission vehicles by 2050, about 70 of survey respondents said. That includes battery electric, plug-in hybrid, and fuel-cell vehicles. “This survey shows us that without thoughtful collaboration and community-facing policies, these changes would lead to increased inequities, vehicle travel and greenhouse gas emissions. We need to be creative to steer these innovations to the public interest,” said ITS-Davis Director Dan Sperling. The European DriveNow fleet currently comprises more than 5,400 vehicles, of which 15.4% are pure electric BMW i3s. As of 31 Dec. 2016, DriveNow served around 607,000 customers in Germany and roughly 815,000 Europe-wide (2015: over 580,000 Europe-wide). DriveNow is one of the main driving forces for electro-mobility in Germany. Around 190,000 customers have already driven approximately 6.5 million emission-free kilometers (about 4.04 million miles) with the fleet’s electric BMW i3. 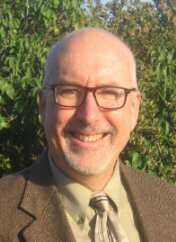 For those interested in staying current on phase two of federal fuel economy and greenhouse gas standards for trucks, and the latest in government incentive programs for clean vehicles and fueling infrastructures, two conferences are coming up that will address these and other significant issues. 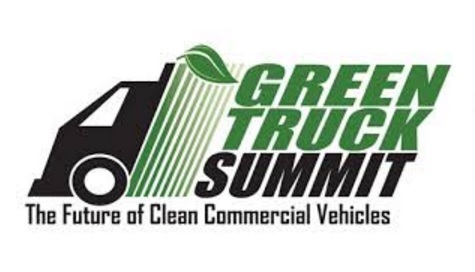 Green Truck Summit, coming up next month in Indianapolis, and ACT Expo, taking place in early May in Long Beach, Calif., provide great opportunities to stay informed and learn more about the latest in advanced clean technologies and fuels best suited to fleet operators and suppliers. 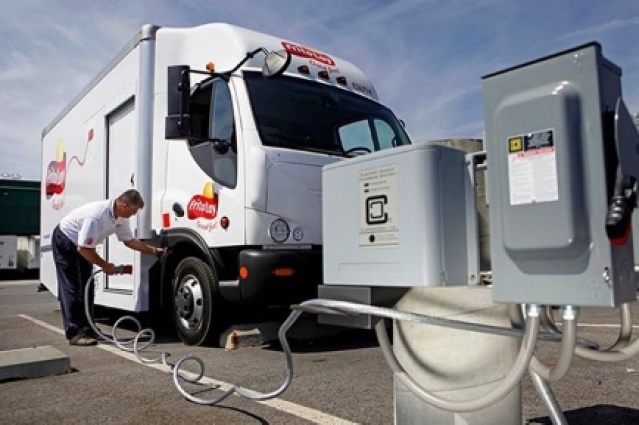 Fleets and transport companies operating medium-duty trucks, delivery trucks and vans, work trucks, heavy-duty trucks, and buses, should consider attending both annual conferences – and should take a look at the latest in alternative fuel vehicle offerings in these vehicle classes. It’s an excellent time to see the latest offerings in vehicles and fueling infrastructure in natural gas, renewable natural gas, propane autogas, renewable diesel, hybrid and electric vehicles, and biofuels. Stakeholders active in Clean Cities coalitions will be attending in large numbers and can tap into discount offers from both event organizers. For Green Truck Summit, free admission is being offered to NTEA’s Work Truck Show and advance member rates for its Green Truck Summit to Clean Cities coalitions and stakeholders. Here’s the registration form, with a promo code presented by Greater New Haven Clean Cities Coalition. For ACT Expo 2017, Clean Cities coordinators and stakeholders are eligible to receive discounted registration to attend. Coordinators don’t need a discount code to register, and can access this registration portal to select their Clean Cities option and register. A panel discussion on the new U.S. Environmental Protection Agency provision, “Delegated Assembly Provisions in GHG Phase Two – A Potential Game-Changer for Multi-Stage Commercial Vehicles,” will take place at Green Truck Summit 2017 on Tuesday, March 14. Matt Spears, center director, heavy-duty diesel standards, EPA; Rob Stevens, VP strategy and engineering, Roush CleanTech; and Ken McAlinden, manager for on-board diagnostics and regulatory compliance, Ford Motor Co., will speak to the issues. The Work Truck Show is produced by NTEA – The Association for the Work Truck Industry. It runs March 14–17 at the Indiana Convention Center. Educational sessions begin March 14, and the exhibit hall is open March 15–17. Green Truck Summit general sessions are held March 14, and concurrent educational sessions run March 15–16. In addition to attending March 14 general sessions, Green Truck Summit registrants have the opportunity to choose from Green Truck Summit and NTEA Work Truck Show concurrent sessions on March 15–16. Dr. Wilfried Achenbach, senior vice president of engineering and technology, Daimler Trucks North America, will give the 2017 Green Truck Summit keynote address. Other topics to be explored include: creating an efficient path to zero-emission commercial vehicles; renewable fuels analysis and vehicle life cycle impacts; government insights and outlook on future policies; and new products and technology applications for fuel use and emissions reduction. Attendees can also participate in the Work Truck Show’s ride and drive event. Attendees at the year’s ACT Expo look forward to seeing the comprehensive vehicle, fueling, and technology exhibit displays and hearing speakers on a wide range of topics. One of the workshops will provide a forum to explore the North American Council on Freight Efficiency’s (NACFE) work encouraging the use of advanced technologies to improve fuel economy for Class-8 tractor trailers. Small group discussions will uncover the benefits and challenges of adopting various technologies, including 6×2 axles, idle reduction devices, electronic engine settings, and automated transmissions. For those attending ACT Expo 2017, taking place May 1-4 in Long Beach, register by March 31 for the value registration. You can view the agenda here. 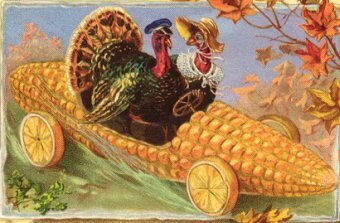 Here’s a look at alternative fuel vehicle news and announcements recently made on the eve of these two industry conferences…………. Urban eTrucks: Mercedes-Benz Trucks is in talks with 20 potential fleet customers in Europe about bringing its all-electric Urban eTruck to potential customers about participating in a European test project. The 124-mile range Urban eTruck will provide fleets with electric trucks designed for short-range commercial deliveries. The company had earlier committed to bringing about 150 of these trucks, including light-duty Fuso eCanter electric trucks, to customers in Europe, Japan, and the U.S. “Following the world premiere in September 2016 at the International Commercial Vehicle Show the customer reaction was outstanding. We are currently talking to around 20 potential customers from the disposal, foodstuffs and logistics sector. With the small series we are now rapidly taking the next step towards a series product. By 2020 we want to be on the market with the series generation,” said Stefan Buchner, head of Mercedes-Benz Trucks. DME-powered trucks: Mack Trucks has started a field test in partnership with Oberon Fuels and New York City’s sanitation department to bring trucks powered by dimethyl ether (DME) to the fleet. The test will use the clean fuel alternative to diesel in a Class 8 Mack Pinnacle tractor with a 13-liter engine for an evaluation run over several weeks, with results to be published by mid-year. Mack and parent company Volvo Trucks have been very interested in DME in the past few years. This will be first commercial test of a DME-powered Mack truck. Long range electric bus: The Proterra Catalyst E2 vehicle series, named for its efficient energy storage capacity of 440 – 660 kWh, recently logged more than 600 miles on a single charge at the Michelin Laurens Proving Grounds in Mountville, S.C. With a nominal range of 194 – 350 miles, the Catalyst E2 vehicles can now serve challenging transit routes on a single charge. Ryan Popple, CEO of electric bus manufacturer Proterra, thinks that by 2020, one third of new fleet bus purchases will be electric and that number will go up to 100% by 2030. BYD in the U.S.: Along with building electric buses at its Lancaster, Calif., assembly plant, BYD has been adding several electric commercial trucks to its product offerings. The company’s workforce of 530 people is expected to triple by 2020. Vehicle offerings now include medium-duty step vans; stake-bed, box and refrigerated trucks using BYD’s trucks in the Class 5 through 7 weight segments; Class 6 and Class 8 trash trucks; and Class 8 tractors designed for the short-haul goods movement industry. Class 1 to 4 trucks are in the development phase. Fuel cell buses: The Orange County Transportation Authority in California will gain more than $13 million to add 10 zero-emission hydrogen fuel cell buses to its fleet, OCTA, in partnership with the Center for Transportation and the Environment, will receive most of the grant funds from the California Air Resources Board for the purchase of the buses, a fueling station, and maintenance facility modifications. Toyota’s fuel cell buses: Toyota has delivered the first of its hydrogen fuel cell buses to the Bureau of Transportation of the Tokyo Metropolitan Government that will run on a regular route starting in March, with a second bus delivery that month. The 76-passenger green bus is the first of an anticipated fleet of 100 fuel cell vehicles being deployed prior to the Tokyo 2020 Olympic and Paralympic Games. Tesla heavy-duty truck: A Daimler executive is working on Tesla’s heavy-duty semi electric truck, but it’s on the backburner behind the Model 3 sedan, according to tweets from CEO Elon Musk. Jerome Guillen was hired by Tesla in 2012 after working for Daimler while playing a leading role in its venture with Freightliner through the U.S. Department of Energy’s SuperTruck initiative. In September, Tesla hired several key Daimler engineers who also worked on the same program, including Evan Chenoweth, who had lead designer of Freightliner’s SuperTruck hybrid engine. Nikola semis: Nikola Motors recently unveiled its prototype Nikola One hydrogen-powered electric semi-truck at its headquarters in Salt Lake City, Utah. By that time, the startup company reported having taken 7,300 pre-orders before the prototype was shown. The company said that the heavy duty Class 8 truck would travel 800 to 1,200 miles while carrying a full load of 65,000 pounds before having to stop at a hydrogen fueling station; and once that happened, refilling time would take just 15 minutes. Christine Dzilvelis, one of the partners who organizes AltCar Expo in Santa Monica, Calif., has a different perspective on what constitutes a successful community event than what I wrote about recently. For example, on Friday afternoon, September 20, during AltCar Expo, a speaker panel on electric vehicle charging stations at multi-family housing units led to action being taken by stakeholders. The intensive three hour discussion led to a planned installation in Santa Monica; key players like Schneider Electric began working out the details. Dzilvelis said the feedback the organizers are getting is appreciation from local residents and from stakeholders such as automakers on hosting a grass roots, hands-on annual event. People are overwhelmed by all of the new technologies, and AltCar Expo makes it easier for fleets, industry, and the public to experience the vehicles and have their questions answered. “AltCar Expo is not a business to make money,” she said. What seems to be working best is strong local/regional events. 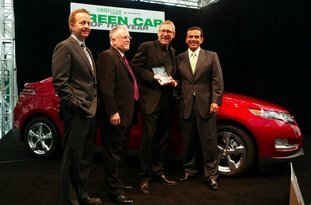 Alternative Clean Transportation (ACT) Expo and Electric Vehicle Symposium (EVS) have been receiving kudos, but other national events like Green Fleet Conference & Expo and Plug-in 2013 are only getting small-to-medium attendance that are very supplier-intensive. 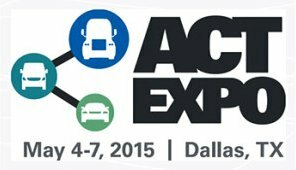 ACT Expo is getting better feedback, but there’s still a lot of concern that it’s dominated by CNG vehicles. AltCar Expo, now in its eighth year, gets positive feedback for playing a role in pushing alternative fuel vehicles forward by bringing together leaders in government, fleets, automakers, and infrastructure, along with local residents who are very interested and supportive of having this event each year. This year, they especially loved seeing and driving the Chevrolet Spark EV, Dzilvelis said. Dzilvelis is part of two other events with similar goals for public education and bringing stakeholders together. The first annual Northern California AltCar conference will be taking place March 14-15, 2014 at the Craneway Pavilion (a former Ford plant) in Richmond, Calif.; it’s sponsored by the Bay Area Air Quality Management District. On March 28-29, 2014, the fifth annual Texas AltCar conference will be held at the Irving Convention Center in Irving, Texas, and is being sponsored by Dallas Fort Worth Clean Cities. (Next year’s AltCar Expo will be taking place Sept. 19-20, 2014.) AltCar Expo organizers are being contacted regularly by stakeholders in cities across the country that want to get their own AltCar conference going. It does seem to be the most realistic event model for bringing the technology and experience to a lot more people.